Bill Whitehouse, former secretary and chair of Derbyshire Cave Rescue Organisation, and Vice-chair of BCRC has been awarded an MBE for services to Cave and Mountain Rescue in the 2017 Queen’s Birthday Honours list. 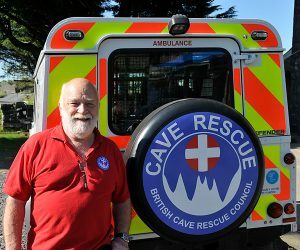 Bill was involved in the formation of the British Cave Rescue Council, serving as Chairman for 36 years – only stepping down to be Vice-chair last year, to take things a little easier! As a keen caver, he became involved with cave rescue when he joined the DCRO team in 1964, becoming a team controller in 1971. Since then he has spent 32 years as DCRO secretary and 15 years as it’s chairman. He has also been involved with Mountain Rescue England and Wales for 30 years, serving on the National Management and Fundraising committees and as a Trustee for 8 years. He helped establish the Mountain and Cave Rescue Benevolent Fund for volunteers experiencing physical or financial difficulties and is an Executive Trustee for the Fund. Since 2001, Bill has also served as the cave rescue member on UKSAR Operator’s, Medical and Volunteer’s groups (he is currently the Vice-chair of the latter group). It is great to see Bill’s long and varied dedication to cave rescue and UK SAR recognised.